I know that it can be challenging to figure out what to do with the kids over the summer holidays . We only get a few short months with them so instead of letting the summer slip away lets get outside and play in the sun. Try something new, laugh… play! Let’s make memories that are going to last a lifetime. Many people look forward to the summer when the kids are out of school. It’s a great opportunity to spend some quality time at home together as a family, so don’t waste it sleeping or sitting in front of the TV all day. Lying around doing nothing is not good for you mentally or physically but sometimes, it can be difficult to get everyone motivated. You can help solve this problem by giving your kids something to look forward to over summer vacation. Plan activities for the whole family to do to keep you active and to help make this summer one of the best you’ve ever had. These 6 tips for summer family fun at home can help you get started. People change over the years, especially kids. As they learn new things, they’re interest change. They may not still enjoy the things that you have done over the past few summers. You may even be a little bored with the regular routine yourself. Have a family meeting to talk about what everyone likes and dislikes along with the ways you would like to spend summer vacation. This type of family discussion will help to bring you closer together and it shows that everyone’s opinion, matters. A great way to have family fun is by engaging in some type of outdoor sport. Play basketball, softball, tag football or ride bikes together. It doesn’t matter which sport you participate in as long as you’re having fun together as a family. However, you do want to choose a sport that is suitable for every member of the family so no one feels left out. Planting a flower or vegetable garden is a good example of a big family project. It will require your attention throughout the summer but it won’t take up a lot of time to plant and tend to the garden. Starting a flower or bug collection is another good idea. Collect at least one item per week by going on nature hikes across your lawn. If you live near the woods, explore the edge of it together. It’s a lot of fun and a great way to learn about nature. Most everyone enjoys playing in the water and cooling off on those hot summer days but you don’t have to go to a big water park to do it. You can make your own mini-water park right in your backyard. It’s easy, affordable and so much fun for the whole family. If you have a swimming pool that’s great but if you don’t, you can set up a kid’s pool to wade around in. Add a couple of water sprinklers to run through and a slip and slide for variety. If you have young children, you may even want to add a sand box to your mini-water park. Painting or making crafts together is a great way to bond and grow as a family. It’s a lot of fun and it can help you get to know each other better. It gives everyone a chance to show a side of themselves through their paintings or crafts that you may not get to see very often. No summer is complete without those delicious outdoor BBQs with the whole family. It’s something special about cooking out over an open grill with the ones you love most. It helps to create a relaxing environment where everyone feels free to talk about the things that matter most to them. Finding ways to have fun together during the summer months will help to bring your family closer together. The memories you make now will last a lifetime, so don’t let this wonderful opportunity to bond and grow together pass you by. 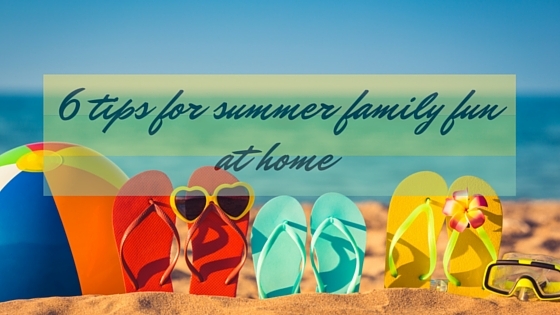 Use these tips to help your family have a wonderful time at home this summer. Are you looking for more ideas for summer family fun? Check our last summers series “Things to do with your kids in the summertime” for more great ideas. We have lots of plans for the summer but I never thought about doing a family project together. It sounds like a great idea. Great tips! The kids and I are creating a garden this year, but I really want to come up with some additional projects to keep us busy! Great tips! A friend of mine tried a mini water park in her backyard last summer and all the kids loved it. I was thinking about doing it this summer at my house. Thank you for sharing these tips and ideas. I am preparing ahead as well for the nearing summer season and one of those is barbecue and korean style grilling. Love this post. Making a mini water park in your yard is a fantastic idea. My kids love to be outside in the summer. Last year we made a big slip and slide. A lot of great ideas. We personally like to do sports and crafts. It’s something fun and relaxing. I think these are all great ideas. We actually have two waterslides, so those make great fun days for my kids. They’re always asking me to put them up, but the weather hasn’t been that hot yet. we always try to do at least a few projects each summer. With us moving into a new house next week, most of our projects this year will relate to getting things organized in the kids rooms the way they want them. My daughter and I always plan our Summer bucket list out weeks before it starts. We are going to have a bunch of fun this Summer painting and playing outside! Thank you for the fun ideas. I can’t wait for backyard BBQs. We love BBQs! Yum! These are all great summer family fun at home ideas. I love the idea of making your own lil water park in the backyard and doing big home projects with the family also. Thanks for sharing the tips. These are great tips. We love backyard BBQs! My husband’s grill is ready for grilling. Your tips are totally and utterly on point. We love hanging out at home in the summer and definitely make a bucket list as a family. Love your idea of turning the backyard into a mini waterpark–our goal for this summer! These are all great ideas for summertime family fun! I am all about spending as much time as I can outside when the weather is nicer. I love spending time by the pool/lake and in the garden as well. Plenty of family friend activities to be had! This is a great list. We love spending as much time outside as we can. We have a pool so that helps, and we love painting which is easy to do outside. Backyard barbecues are a HUGE part of our summer. We love to break out the grill and have a bunch of friends over. Between my husband grilling and all the dishes the rest of the gang brings… MmmmMMMM. These are all great ideas! I love the last suggestion – have plenty of backyard BBQs. Now, that’s what I call summer family fun!